Boy if this group of “4-wheelers” don’t make you laugh nothing will. 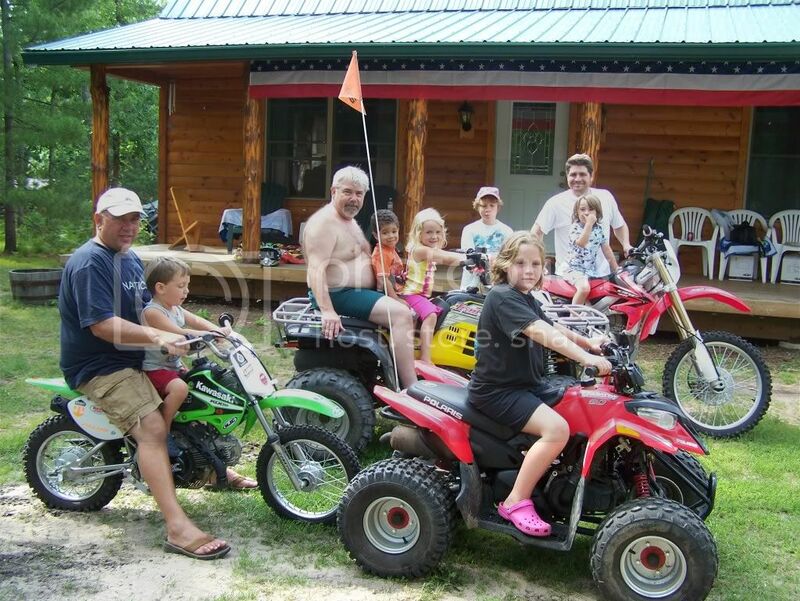 Actually we had two dirt bikes and two 4-wheelers with us for the first weekend of our 10 day vacation. Son-in-laws Mark (Chicago) and Tony, along with Tony’s son Quinn and his daughter Nina did the real off road riding, as they went to a state run 4-wheel/motorcycle trail just south of the cabin. They had a blast, but last day they road Tony hit a stump, and got thrown for a loop. He hit his head on a huge rock, but thankfully was wearing a safety helmet, and was ok! He did however suffer an injury to his elbow, for which we took him to the Manistee hospital emergency room. They were great, and had x-rays taken in no time. No broken bones just alot of swelling and bruises. Tony was sore for several days, but knows it could of been a whole lot worse. 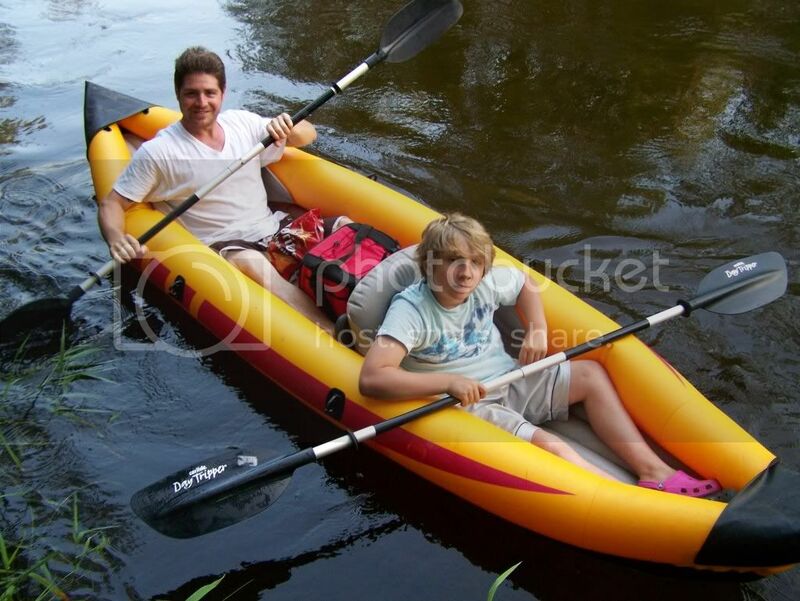 Mark and Quinn were the only two to venture down the Little Manistee in my inflatable kayak. It normally is a 1 hour trip from where they put in, and we were going to pick them up at the nine mile bridge. Manistee had a real severe thunderstorm with major straight line winds, and many trees were blown over. I guess several of these trees were laying across the river, and it took some maneuvering to get around them. In the course of going over, around, and through these trees the kayak developed a couple holes on the inflatable underside. The guys were on time for pickup, but the raft was just barely keeping them afloat at that point. Another couple hundred yards, and they would of been walking home! The inflatable kayak is great for that kind of river float, but I’ve patched it quite a bit already, and don’t know if this “river queen” will make it one more year. The Little Manistee was named a National Historic River a few years ago, and I don’t think fallen trees are removed by the state. If those trees are going to be taken care of I suppose a few of the local landowners will need to get their chain saws buzzing. If there still there next year we may have to spend a day on the river just to clear us a path for the kids. From what I saw of the deer herd around the Manistee area, they survived the winter quite well. 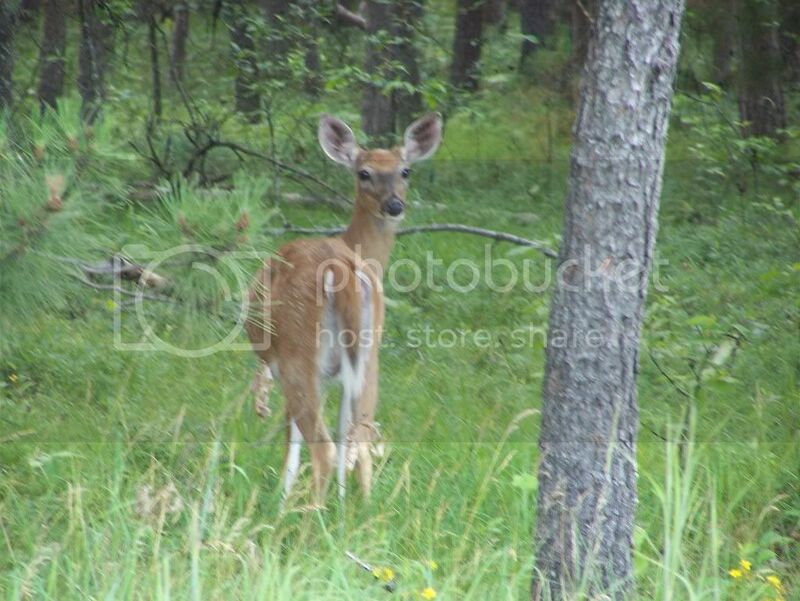 This doe was one of many we saw that had multiple fawns with them. We even crossed paths with a doe that had three fawns with her. The one in this picture had twins. I got a couple pictures of them also, and they looked real healthy. It’s been about four years since I hunted the area, but I just might give it another try this year. I saw three different bucks in the area, and they looked like they will end up as 6-8 pointers. Of coarse they wouldn’t hold still long enough for a camera shot. 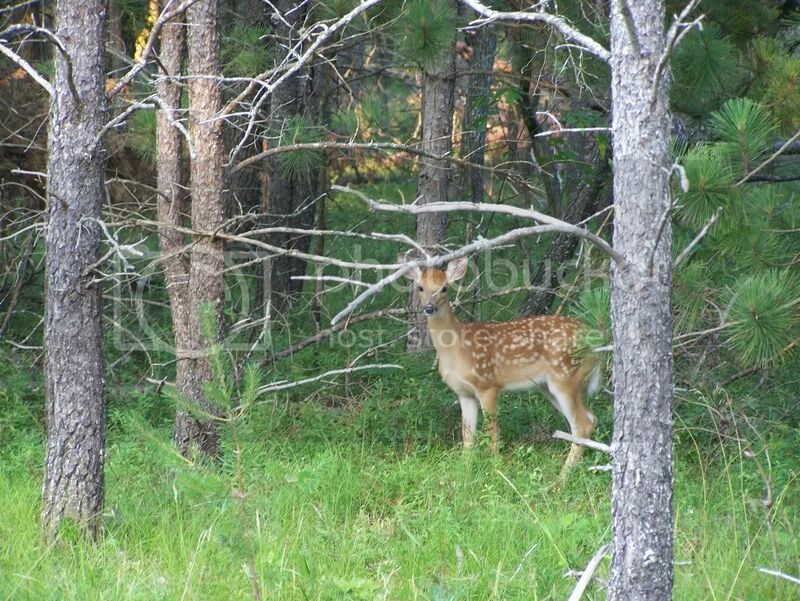 I got off the road and scouted a couple of different state area’s, and the deer sign was everywhere. The few years I did hunt around here, I only took two doe’s with my bow, while my son-in-law was putting the bucks on the ground. I just didn’t see that many deer, but it looks like that may be a different story this year. We’ll see what the future holds this fall! 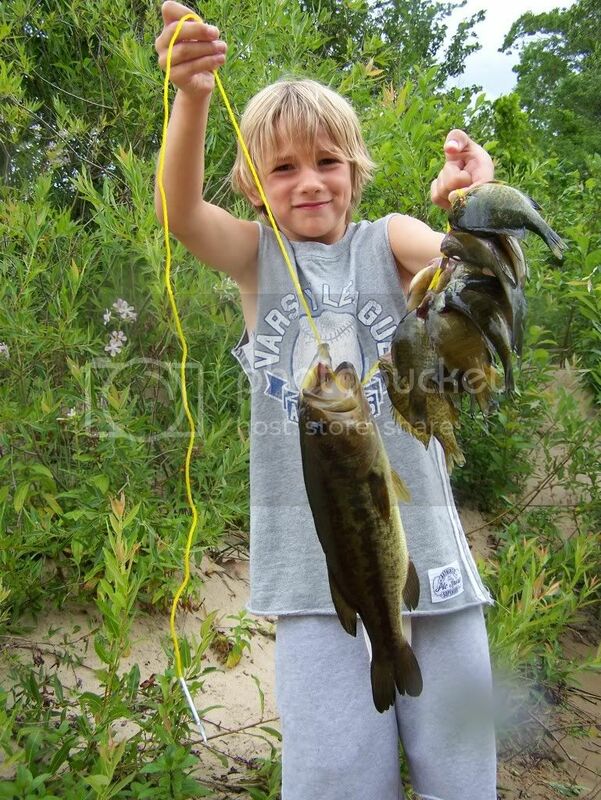 This is my grandson Keegan (we call him Bubbie) and some of the fish we caught last week. 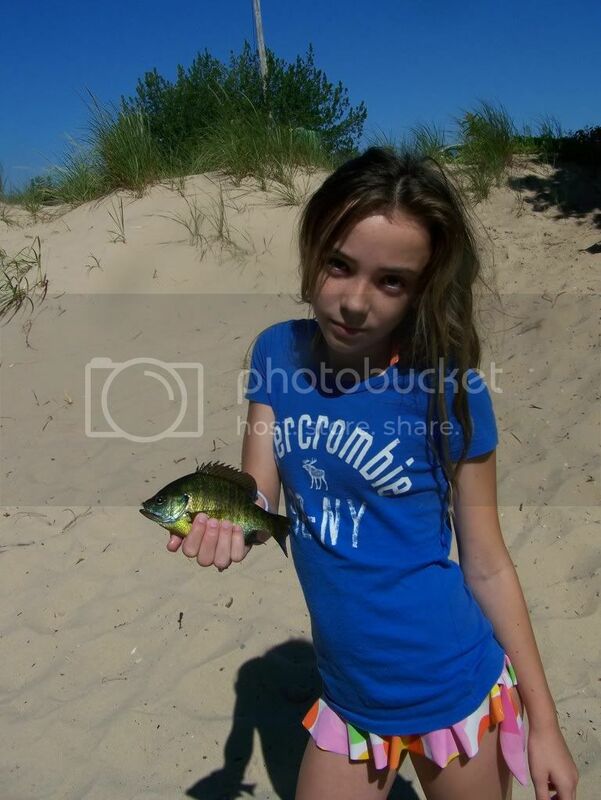 Also my granddaughter Nadia who caught some really nice sunfish and bluegills. I don’t get to see these two enough, so it was wonderful to get to spend some fishing time with them. Bubbie turned out to be a natural when it comes to fishing. The first time we went out he caught 13 of the 17 sunfish/bluegills and he let me catch the bass. Actually he really did! Just before this 15″ largemouth took my “leaf worm” offering, Bubbie said “You aren’t going to catch a bass dad!” (some of my grandkids call me dad) The words had barely left his tongue when Mr. Bass got overly excited, and made a fatal mistake. I don’t know who was more surprised, Bubbie or me! I cleaned the the fish that evening, and froze them for a day when my fishing buddies can eat them with me. Nadia went with Bubbie and me the following day, along with Kyle, and his favorite “snoopy” fishing pole. Nadia caught several very nice sunfish, and Bubbie caught a couple we put in our bucket.� On our way to the lake I said a little prayer and asked God for a nice day, the fishing hole to ourselves, and for Bubbie to catch a bass.� We had a gorgeous day, no other fishermen around, and Bubbie caught his very first bass!� It was only about 10 inches long, but you would of thought it was a new world record!� Thank you God! That day we decided to release the ones we had caught, and the kids got a big charge out of letting them go back in the water. I explained to Bubbie that we had to release his trophy bass, so he could grow to be much bigger, and he didn’t have any problem with watching him swim away.� I told them we only needed enough for a meal, and if you aren’t going eat the fish, put em back where they came from. Kyle, who just turned 3 caught about 8 fish all by himself, and I don’t know if I’ve ever seen a bigger smile on a kid. He thoroughly enjoyed himself. I really cherished my time with the grandkids, and I’m pretty sure we have at least three confirmed anglers on our hands. 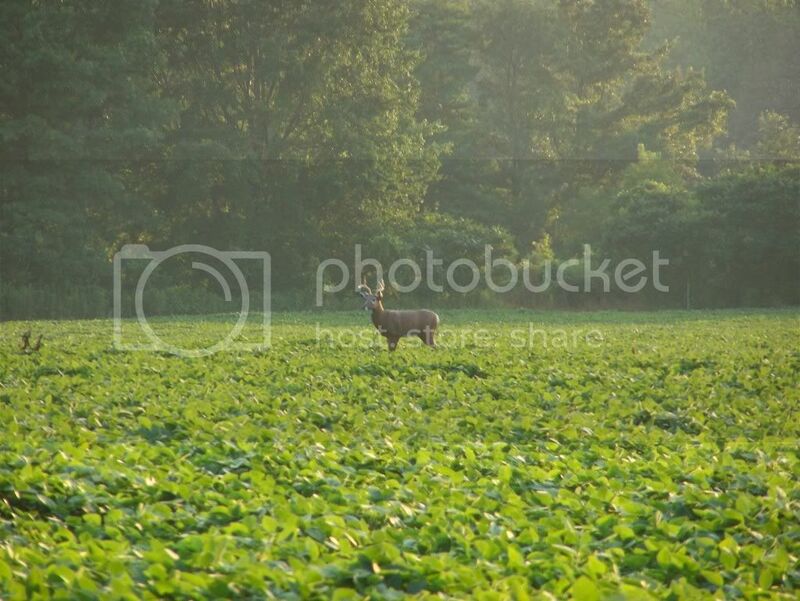 Well we are finally back from our up-north vacation, and look who was ready to greet me, once I entered Monroe county.� I was still about 10 miles from my house when I saw this nice buck standing in a soybean field.� It was about 150 yards away, but my camera was handy, and it has a telephoto lens.� I stopped right in the country road, and hoped the deer would hold still long enough for a coupe good shots.� My wife kept telling me I was blocking traffic, and I responded that “They can go around me!”� The buck posed like a statue, as it seemed to turn it’s head, and look right at us.� My “non hunting wife” said “That can’t be a real deer, cause it wouldn’t stand there that long!”� I zoomed in as much as I could without “blurring” the focus on the camera.� I thought I got a good picture, but couldn’t really tell, as I only have an 1-1/2 viewing area on my Kodak camera. We left that nice buck , still standing among the beans, as I headed home to transfer this “buck” to my computer!� As you can probably tell from the enhanced photo my “non-hunting” wife was right.� “I swear I saw his head move!”� Someone; somewhere was getting a good laugh at my expense.� Besides any hunter, worth his salt, knows that the deers antlers are in velvet at this time of year, but at that distance they looked “fuzzy” to me.� The comedian that “set me up” wasn’t the only one laughing, as my wife got quite a chuckle out of it herself. I just recently read about a huge Rattlesnake being captured here in Michigan, and even saw a picture of it!� The article never stated that it was a Massasauga rattler, but it didn’t saw it wasn’t either.� I’m here to tell ya; that 8-1/2 foot snake was “not” native to Michigan!� Massasauga rattlers are Michigan’s only rattlesnake, and they are a bit on the small side.� A 4 footer would be a nice size Michigan snake.� The serpent I saw in the picture weighed over 90 pounds, and had the distinct diamond shape markings on it’s back.� So my brilliant deduction is that this huge snake was raised in someone’s home, and let go, or made a run-for-it on his own! 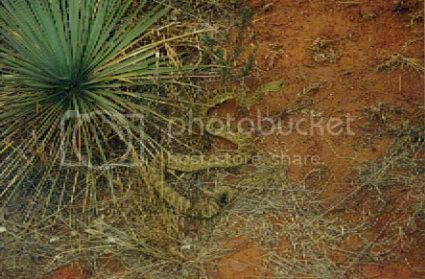 Any hunter who has roamed our western states knows he has to be on the lookout for the snake in the above picture.� This one crossed my path while on one of my Colorado trips.� It is about a 4-1/2 foot Western Diamondback.� Not a real big one, but still big enough for me not to press him too hard.� He didn’t really want to fight, just wanted to get in the shade or under a rock.� I preferred he go there myself.� One thing I’ve learned while hunting out west-always check the ground around the area you plan on taking a break in.� I once sat on a big boulder, only to discover a “nest” of snakes curled up underneath.�� I’ve never done that again! We Gave Em A Licking! We met up with the Tibia’s and the Verhille’s from Monroe quite by chance. Not only are they from Monroe, we all attend the same church. It was quit a “hoot” to run into so many people we have known for years 260 miles from home. Those ice cream cones took a “licking” the day we all strolled into town! Not only can you get 36 flavors of ice cream, but they serve great food, especially their turkey dinners. No lunch meat in this restaurant! They roast their turkey on a rotating spit, and you can watch them slice your portion off, if you wish.� My wife and I got the turkey dinner with all white meat, dressing, mashed potatoes, gravy, cranberry sauce, biscuits, honey, and cole slaw for $8.99!� Now that’s a deal! 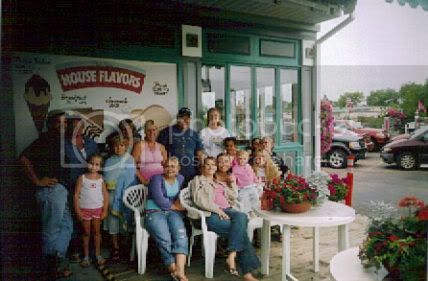 Sorry about the lack of blogs over the last several days, but we’ve been having so much fun I haven’t wanted to go to the library to do my blogs!� I just posted two, and there will be more coming, but probably not for a few days.� It has been a great trip so far even with all 10 grandkids envolved. 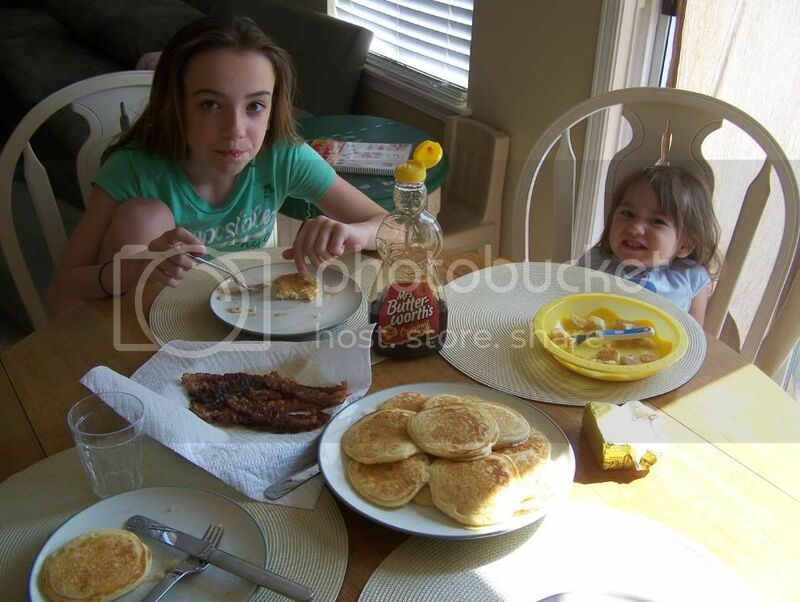 Pancakes and bacon don’t last very long around my grandkids.� It’s every man, women, boy, and girl for themselves when it comes to “hot-off-the- griddle” flapjacks when were on vacation.� Nadia and her little sister McKenzie were the early birds on this batch, and they dove in without any coaxing.� If you snooze you may loose-a pancake or two that is! Nothing smells better to me than the coffee brewing, bacon sizzling, and pancakes turning golden brown on the griddle early in the morning.� You would think with that aroma drifting through the cabin, everyone would be up-and-adam, but there is usually a slacker or two.�� After a couple of times of having to settle for the tail-end of my homemade recipe, sleepy-heads start getting up earlier! My wife puts all the dry ingredients together before we leave.� The buttermilk, eggs, oil, and vanilla are added just before we mix everything all together.� It’s much more efficient that way, and makes far less mess.� Bon-a-petite. Check out the crystal clear blue waters of Lake Michigan in the background.�� We have been spending our summer vacations around Manistee for about 4 years now, and do we love this area.�� My brother-in-law Pat has a log cabin around Wellston not far from the Little Manistee River.�� One of� the days we’re going to raft/tube the river for about 2 miles.�� It’s a trip we can even take the two year olds on, as long as they have a life jacket.� It’s a good way to cool off on a hot day.� We usually stop on a sandbar and do a little water fight or something. 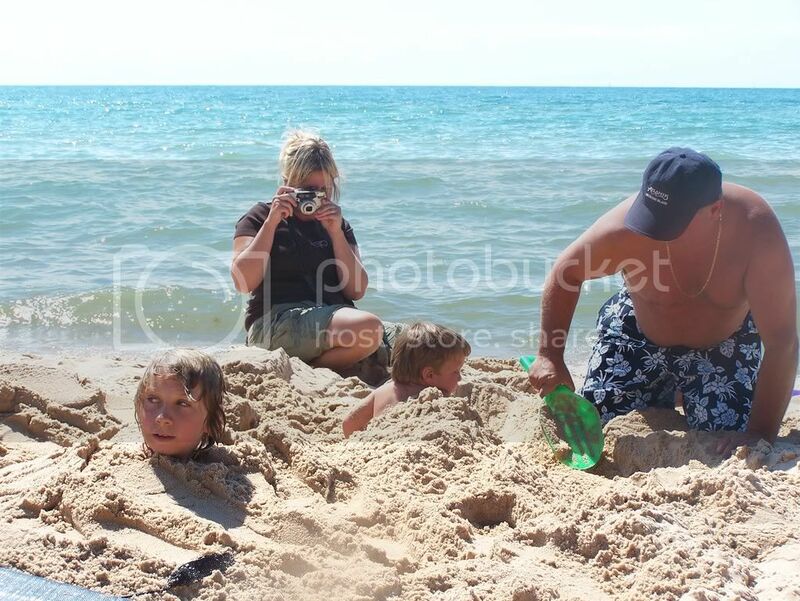 (like dunk my oldest grandkids)� When we go to the beach on Lake Michigan we usually spend the whole day.� Jay loves to play with his big brother Quinn, and it can be quite an ordeal keeping your eye on 10 grandkids!� We pack a picknic lunch and bring plenty of drinks, lotion, and beach lounges.� I love vacations! How much hunting “stuff” can you stuff into one small drawer I’ve often wondered? Well now I know! In my garage I have an old dresser from when my kids were little. It’s just a typical 6 drawer dresser that I now use for miscellaneous household/fix-it items. Because I never have enough space for my hunting “booty” I designated a drawer for hunting stuff. Each time I open the drawer I think it’s going to break, as it weighs “an Irish ton!” Today I decided to empty it and see just what is actually weighing my ship down! Here is a list of what I came up with. 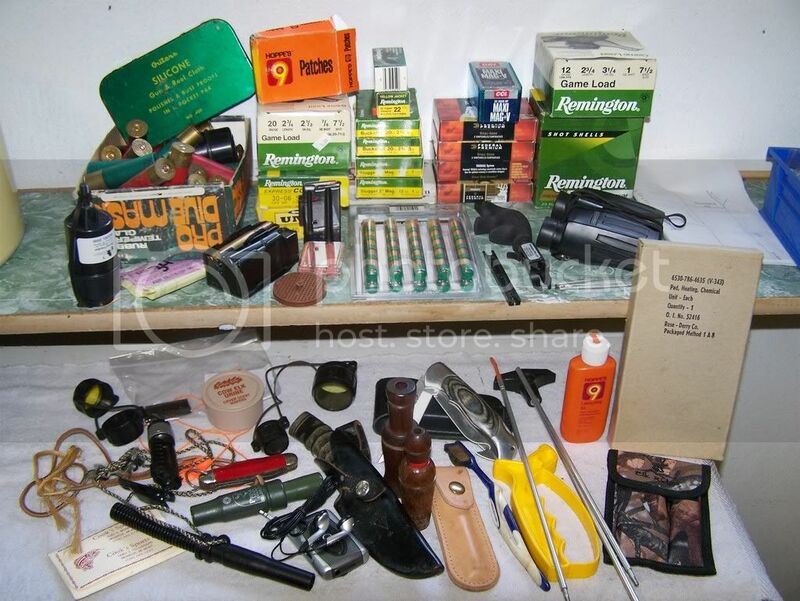 2-scope covers, 4-knives, 2-duck calls, 1-predator call, 1-grunt tube, small flashlight, cow elk urine scent wafers, ear plugs, old hunting license (unfilled) muzzleloader iron sights, broadhead sharpener, knife sharpener, Hoppe’s gun lubricant, gun cleaning rods, hand warmer, binoculars, bow release, string tracker, 2-30-06 rifle clips, 1-22 mag. clip, package of chalk, gun cleaning rag, scent masking wafers, directions to various properties, Hoppe’s gun cleaning patches, 1-box of 10 gauge shells, 1-box 12 ga. game loads, 1-box 20 ga, game loads, 2-boxes 22 long rifle, 1-box 22 mag’s, 1-pkg. 50 caliber bullets, 4-boxes 12 ga, slugs, 2-boxes 20 ga. slugs, 1-box of assorted shells and bullets, 1-box Winchester 3″ slugs, 2-boxes Remington 3″ slugs, 1-box 30-06 180 gr. core lokt rifle shells, 1-box S.W. 40 cal. 180 grain pistol bullets, primer cap removing tool (so thats where it’s been hiding!) broadhead cleaning toothbrush, and a stupid hearing aid I bought off an infomercial that was a total rip-off! Man no wonder that little 14″x14″ drawer is so heavy! The sad thing about this whole story is I have five (5) other drawers just like this one. Don’t tell my wife!